"At KC Fence & Deck we aim to do everything to provide you with the highest quality and lowest prices "
The Tuf-Barrier™ Noise Wall System by Harder Luckey & Hargrave is the evolution of the traditional noise wall. Providing sound abatement solutions for state and municipal transportation departments. Products for pre-construction noise mediation and remedial sound abatement solutions. Inspire confidence in your customers with a cost competitive alternative noise wall product. Cost effective wall products to keep you regulatory compliant. A cost effective noise barrier wall product to compliment your existing lines . Let our helpful staff answer your questions about a sight and sound barrier for your home. HLH manufactures two types of it's Tuf-Barrier™ noise abatement wall system. The "32 STC-Heavy Wall" system meets or exceeds AASHTO guidelines in the key mass requirement, wind load sustaining (most heights and velocities) and decibel reduction criteria. The more economical "25 STC-Medium Wall" system, while lighter, still provides exceptional sound reduction performance. Both systems are aesthetically pleasing, easy to install, remarkably rugged and virtually maintenance free. Used in situations where AASHTO Guidelines do not need to be met but where an effective sight and sound barrier is needed. Suggested uses include subdivision perimeters, light commercial & residential noise barrier walls and loud equipment screening. STC25 rating - still exceeding mandated minimum but at reduced cost. Surface density of 2.36 lbs/ft2. The Medium Wall STC 25 Tuf-Barrier™ noise barrier is the right choice for light commercial and residential projects. With an STC 25 and an uncomplicated installation, the Medium Wall Tuf-Barrier™ noise barrier can be purchased by small businesses and residential customers for self installation or local contractor installation. An easy to install noise barrier wall with the sound stop properties of a commercial / highway noise wall. The Medium Wall Tuf-Barrier™noise barrier can be used in situations where AASHTO guidelines do not need to be met, but where an effective sight and sound barrier is needed. The Medium Wall STC 25 version of the Tuf-Barrier™ offers noise reduction similar to wood sound barriers (typically STC 24) that is maintenance free at a competitive cost. The Heavy Wall Tuf-Barrier™noise barrier panel is comprised of the industries thickest and heaviest tongue and groove PVC rail. With rail dimensions of 2.75" x 6" (face height), rails are stacked one upon the other, snuggly within National Vinyl H-Posts, to the desired height and capped with a "flat top" finishing rail. System height determines post type to be used. To 6' heights; structural (.125" wall) steel is mandated. The reinforcements are covered with a PVC H-Post, for a clean, uniform finish. For greater heights, the use of vinyl sleeved steel I-Beams is required. Post centres (panel widths) are available in sizes from 8' to 14' wide. Color can be uniform throughout, or different rail colors can be used for a contrasting appearance. Alternatively, posts, bottom and top rails can be of one color and "frame" the panel which itself can be of another color offering. The Heavy Wall Tuf-Barrier™ noise barrier fencing system is not only designed for highway or key secondary road applications. It is also an excellent choice for subdivision perimeter fencing; with no costly upkeep for cities, property developers or individual homeowners, commonly incurred when wood perimeter fencing is used. The Heavy Wall Tuf-Barrier™ noise barrier will remain aesthetically pleasing to homeowners and can be used in conjuction with Tuf-Fence® styles - running as fingers from the perimeter sight barrier to (the) individual homes. Other applications: business property "borders", storage compounds, enclosures, town-home patio partitions. Significant test data is available. Architects, engineers and other interested parties should contact Harder Luckey & Hargrave for more information. *Colors may not appear correctly on some screens, please request a sample for confirmation. Near zero-maintenance. No aftercare (painting/staining) required. Rain will wash most accumulated (environmental) residue away. Excessive dirt can be power-washed away if desired. Graffiti can be removed with detergents or solvents. Easy installs - no heavy equipment required with panel (rail) placement. Walls can also be easily configured to house "doorways" & portals for access to city services like hydrants. 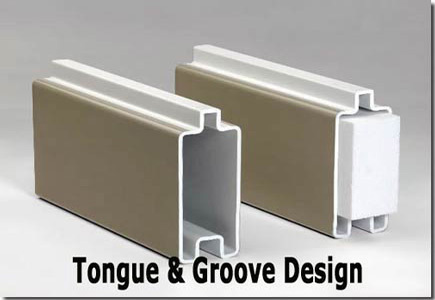 Various colours and "patterns" are available for contrast or for a more aesthetically pleasing finished structure.